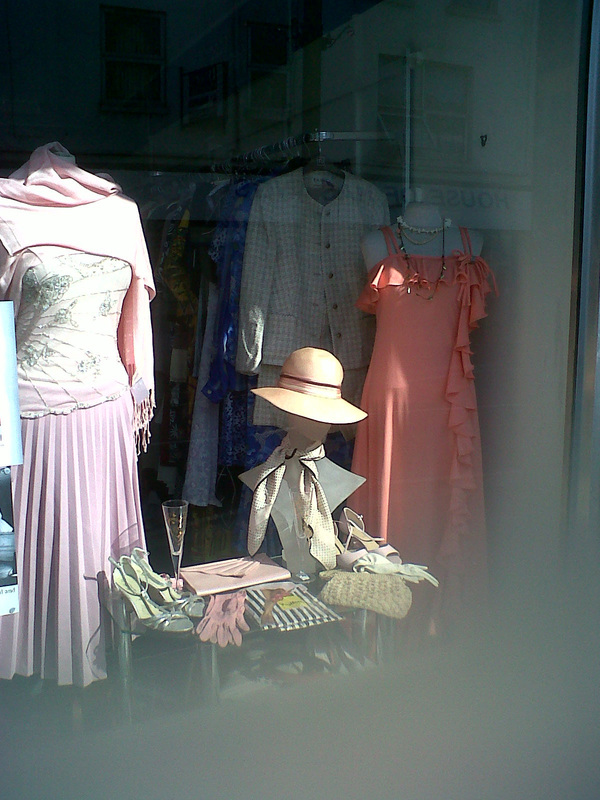 This is the window display at the St. Michael's Hospice Charity Shop, Queens Rd, featuring all the outfits that were showcased at the recent Cake & Earl Wedding Fair and Catwalk Show in Tunbridge Wells. The beautiful 70s salmon coloured lycra dress with diamante detail is to die for - it would be mine if I could just fit into it (size 10) - and the beaded organza top combined with a pleated skirt ( I somehow have a thing for pleated skirts) and a pashmina (always perfect for weddings: demurely wrapped around the shoulders during the wedding service and then flung off at the party when dancing on the table - ahem!!!). And those cute accessories: straw hat, beaded vintage bag, those very chic gloves, pink fake snake clutch and those seriously beautiful Best-Man-Beware vintage Woolford stockings ...!!! Looking THAT gorgeous your only job is to catch the bride's bouquet!!! So start working out, girls!